Today is my nephews 10th birthday. This is the card I made for him. 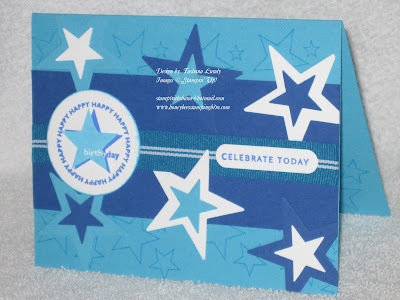 I used Tempting Turquoise, Brilliant Blue and Whisper White card stock and coordinating ink. The ribbon is Striped Pacific Point. I also used the Word Window, 1 3/8 Circle, Small and Large Star punches. The stamp set is Starring You.